A1 Poster Printing Price – in our Jalan Ipoh KL kedai printing & photocopy shop costs different compared to our second PJ Uptown photostat shop. A1 Poster Printing Price – in our Jalan Ipoh KL kedai printing & photocopy shop costs different compared to our second PJ photostat shop. Digital printing services offered at our kedai fotostat in Uptown Damansara Utama, Petaling Jaya, Selangor uses different large format poster printing machines. Custom A1 poster printing that need to be printed at our Kuala Lumpur digital printing company will take 1 day to complete. *WhatsApp to enquire first, solid color might have lines due to this type of printer. Print speed = less than 1 minute. *Print speed = 20 minutes. Damansara shop can do 33 inch. KL shop wider, call to enquire. The example poster print is printed on the matte type new printer at our Jalan Ipoh printing shop using CMYK inkjet, that is also waterproof. The glossy poster mentioned here uses a large format printer for graphics and art. This premium inkjet, high gloss poster features wide color gamut with 8 color inkjet combination, above the standard 4 color CMYK inkjet, for a superior best quality graphic printing for art and design. 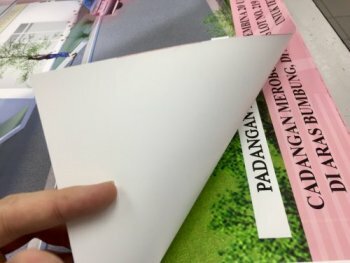 The poster is non-waterproof however you can do A1 laminating service to make these best quality poster printing in Kuala Lumpur better than our other printing machine that does cheap poster printing. Available maximum 33 inch, A0 size for printing, and A1 size maximum paper laminate size.